Of a stranger at midnight’s hour. We have had computer problems the last week and a half, so I have had to use the laptop which did not have my Garden Show at the New Orleans Botanical Garden photos on it. The new computer is up and running and the photos have been reinstalled, so now, I can finally wrap up the Garden Show. This is a photo of a Crinum procarum ‘Splendens’. I was surprised that a crinum was getting ready to bloom so late in the year. 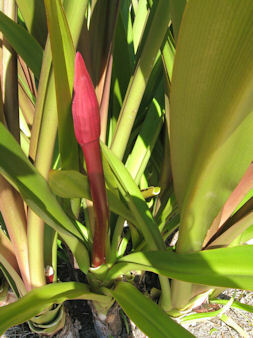 I found the burgundy colored stem and bloom to be outstanding against the green foliage. The one crinum I have only has a green bloom stalk, so it really does not stand out as this one does. Unfortunately, none of the buds had opened yet, so I do not have a photo of the flower, but Dave’s Garden does here. The next bloom cluster was buzzing with bees and butterflies. The bright golden color stood out from a distance. I just love that golden color in the fall. It just seem so appropriate for the season, just like a daffodil’s light lemon yellow seems to say ‘Spring’. Since my sisters and I had such a great time together at the fall garden show, I can hardly wait for the Spring one. When I first started gardening, I was living in an apartment with just a patio, so I started out with container plants. I still have many plants in containers for various reasons. For example, tender plants that must be protected from winter’s chill, plants that beautify the front porch or patio, and those I just haven’t been able to get around to planting in the ground. But, I have been wanting that one, big focal point container. The one that really draws the eye. The one you see in magazines or garden books that just makes you stop and stare. I haven’t come up with one yet that would fit in with my garden, but I did see one at the garden show that I would love to have. I would need a very large area for this large container arrangement, but it does give me some ideas. I liked the way it was planted underneath. 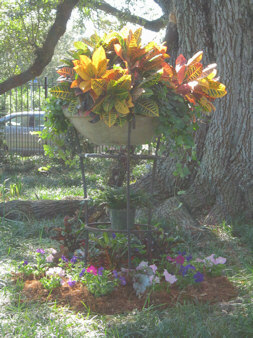 Using a shorter frame for a container, you could plant around the base and have the same effect. I liked the way the ground plants anchor this tall frame and container into the area. The crotons with the green trailing plants are great for fall color. By using ivy as the trailing plants, you could then just have to change out the center plants as the seasons change it you wanted it to be seasonal, or with hardy plants it would be great year round. I was even thinking that maybe a blooming hydrangea for spring would be nice, and when it stops blooming, just plant it in the garden. With a large container, the possibilities are endless. The more I look at the photo I took, the more I think I can duplicate this on a smaller scale, and then, just maybe, I will have that focal point container I’ve always wanted. 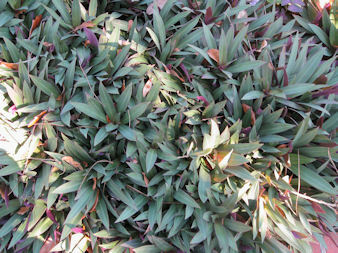 When I attended the Garden Show in mid-October, I was again attracted to the oyster plants (tradescantia spathacea). This is the second time I have seen them growing in the botanical gardens, and I think I will try and grow them in my garden. They are hardy only through zone 9, and I live in zone 8 (really just on the border of 9), so I think I can risk it. Since it rarely gets down into the low 20’s here, and zone 9 is 20 -30 degrees, they should be safe esp. if I would cover them on the rare hard freeze or plant them in a fairly protected area. I have read of one gardener who lives in zone 8b who is able to grow it, so that is encouraging if I decide to definitely try it. I would like to try the variegated ones. They would make a lovely ground cover with their white, pink and green striped foliage with purple undersides. 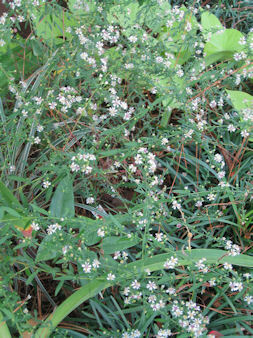 The plant makes a rosette with leaves are about six to ten inches long. At about eight inches high, it would make a nice thick mat. The common variety has leavew with purple undersides and dark green on the topside. I know they are supposed to be invasive in warm areas like Florida, but where I would like to plant them is not too fertile an area, so I don’t think I would have a problem. They are supposed to be good in dry areas in sun to partial shade. So, they sound like the perfect plant to try in front of the bamboo stand that is growing in the side yard. While visiting my sister’s home, I was impressed by her Queen Palms which were in bloom and also had large hanging fruit clusters. Queen Palms are hardy to at least 20 degrees, so they do well in the New Orleans area. Hers are about twenty feet tall and could get as tall as forty or fifty feet. 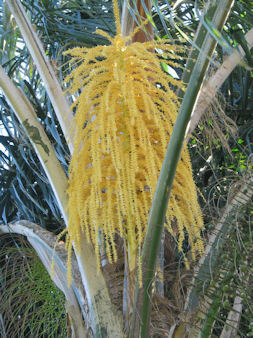 As with all palms, these are so graceful with their fronds swaying in the breeze. The first thing I noticed was the large flower cluster. 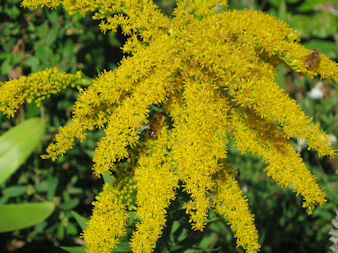 It was bright golden yellow, about three feet long, and buzzing with bees. Also, on the trees were the huge hanging clusters of fruit. They must have been at least four to five feet long. There were hundreds of green oval fruit which made for a spectacular showing. 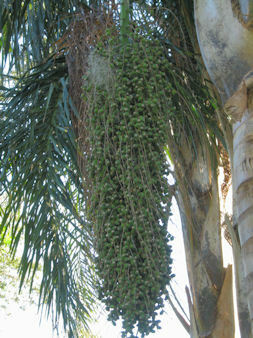 My sister has three palms around her pond and each one had at least two of these long, pendulous bunches of palm fruit. The green dates will soon turn orange which should make for an impressive sight. I don’t know about having all that fruit dropping from above, but with the beautiful flower clusters and the huge hanging date clusters, at this time of year, I think I could put up with their falling. Tonight, we are having our coldest night so far (low in the mid 30’s) which is just the beginning of cold weather for the next few months. Anyway, it is nice to be reminded of tropical palms, the warm weather they symbolize, and that winter won’t last forever. 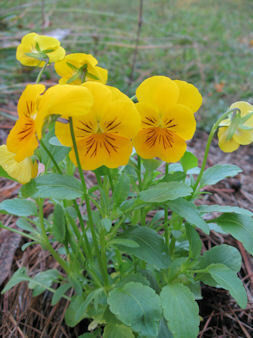 It is that time of year when it is time for winter annuals to be planted in the Gulf South. In the past, I have put in petunias, pansies, and snapdragons in the flower beds and violas in containers. All of these are winter hardy here and last until May. This year I don’t think I am going to put out as many of these winter annuals as before. I am thinking more of placement for just spot color. Today, I bought a flat of yellow violas to place in the circle garden. This is the garden that is mostly yellow flowers. I am trying the violas this year because I think they will do better than the pansies I planted last year there. I was a little disappointed in the pansies I planted there last year because many of them died and the rest did not bloom very well. Usually, every thing I plant there does extremely well in the winter. I am hoping it was just bad plants and that this year the violas will do fine. I chose violas this year because even though the flowers are smaller than the pansies’ flowers, they do have more blooms and spread more. What I really wanted to get was the panolas which are a cross between a viola and a pansy. They bloom profusely like violas, but the flowers are a little larger more like a small pansy. Unfortunately, not many places seem to be selling them. Whenever I plant pansies or violas, I always sprinkle some bloodmeal around the plants and then water it in. I learned this from my dad who always did this and had gorgeous pansies. These plants are heavy feeders, and the bloodmeal gets them off to a good start. I haven’t decided what I am going to do in the rest of the garden, but I guess I need to decide soon (like this week). I will at least put in some winter annuals in the entry garden. I usually put in red and purple petunias there, but I saw some nice purple violas this morning, so I may put in them with the red petunias. Decisions, decisions. 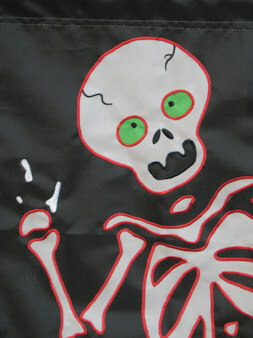 Where would we be without those odd volunteers that always seem to pop up in our gardens? Many are unwanted and are pulled up right away, while some are nurtured or transplanted to another area. I have written about a mugwort volunteer that has added to the garden. Now, I have another native plant that has volunteered to do duty in my garden. This is the second year this plant has been in the entry garden. When I first showed up, I wasn’t sure what it was, but it did look familiar. 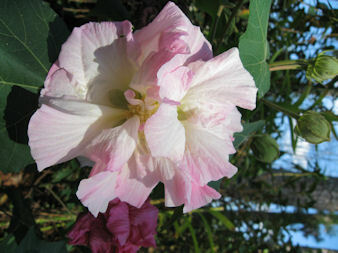 In the fall, it started blooming and that assured it a permanent place in the garden. I wasn’t quite sure what it was. At first, I thought it might be a wild aster, but now I am almost sure it is ironweed. It really is a prolific bloomer. The first year it grew rather tall and lanky, but this summer, I cut it back twice which made it a little stockier. Even though the flowers are small, there are so many of them that there still is a nice display. Most of the other flowers in the entry garden are played out by this time of year, so this sweet little volunteer is a welcome addition. Take the poll and tell how you feel about volunteer plants that show up in your garden. Don’t you just love the common names of some plants? They are so evocative. Names like Naked Ladies, Love in a Mist, Kiss Me Over the Garden Gate, and Dancing Girl Ginger (Globba schomburgkii). While at my sister’s house last Sunday enjoying the company of my family esp. my sister from Virginia, my oldest sister took me around to see her Dancing Girl ginger. It was in bloom and so gorgeous. She was excited because she almost lost them during the winter. Hers is Globba winitii. Aren’t these lovely? They are hardy to zone 8 but will go dormant when night time temperatures consistently fall below 60 degrees. They can be grown in containers in colder areas. They need partial shade and moist soil. These unusual and showy flowers really add to a border in the late summer – fall. 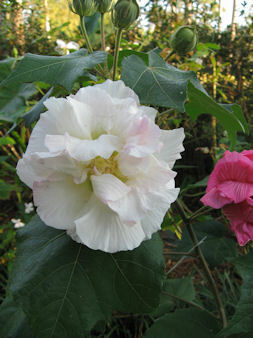 The white Confederate Rose (hibiscus mutabilis) that I bought at the Garden Show Saturday has been blooming non-stop. I have the pink one growing in the back garden, and I knew its blooms start out pale pink and gradually darken as the day progresses. But, the vendor, who sold me the white one, was not very clear about it changing color, so I wasn’t sure if it stayed white or would change. Well, Sunday morning, I found out it definitely changes. 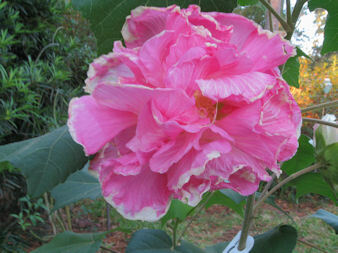 There was a bloom on the bush that was still open, and it had turned a dark pink. Here is a progression of color changes. 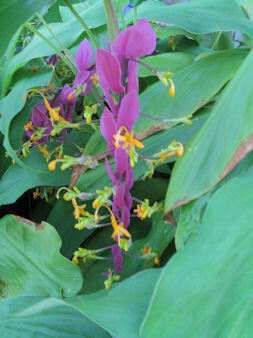 By having the colors of the flowers change, it is almost like having two different flowering plants in the garden. 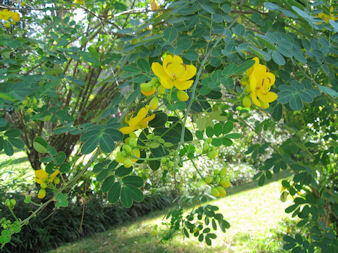 One sign of true fall finally arriving here is the blooming of the cassia (Senna bicapsularis) plants. They are one of the last plants to bloom before winter really comes, and they flower in an autumn yellow or gold, not the bright yellow of spring. Mine has just started blooming with pea-like flowers. 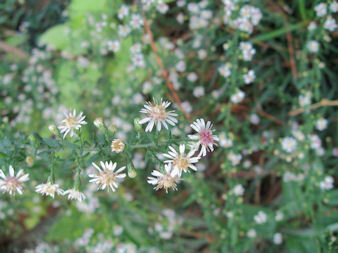 The flowers last a long time, attract bees and butterflies, and are usually in bloom for almost a month. I have let mine grow into a small tree instead of as a shrub, and it is about twelve feet high. This plant is hardy to zone 8 and may freeze to the ground but return in the spring. After being planted for about two years, mine has no longer frozen to the ground, just some tip damage. This is a heavily blooming plant with huge flower clusters. At its blooming peak, flowers cover the entire tree. It is esp. striking on cloudy days or in early evening because the flowers seem to almost glow in the dim light. It won’t be long before more flowers open and the tree is covered in golden flowers. There is one down side to this plant, however. It is easily blown over by high winds the taller it is. Since it is a fast grower, I usually cut mine back around the middle of June, and then it does not fall over so easily. It does not seem to have a very deep root system, so staking it helps, too. I think this spring I will cut it almost to the ground and let it start over. Hopefully, that will keep it smaller and not so susceptible to falling or leaning. This is a very easy to propagate plant, too. Just take some cutting and place in soil, and before you know it, you have new plants. I have done this many times to give plants to neighbors and friends. When this cassia reaches peak blooming it can only be described as incredible. I have had many people stop and ask what it is because, when in bloom, it is so spectacular. 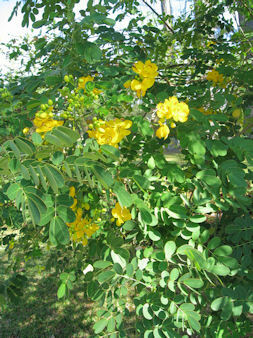 So, now that the cassia tree has started blooming, I know winter is not too far off.